Fiduciary duties are long established legal concepts, particularly in the context of directors of companies and the company. Associated with these duties of company directors is the “proper plaintiff” rule espoused in Foss v Harbottle (1843) 2 Hare 461 which stated that only the company had standing to take actions for wrongs done to it. The rule was eventually weakened by judicial discovery of exceptions and finally removed by statute in Australia. In the public sector however, there is less precedent surrounding directors of public entities and whether their duties are also fiduciary in relation to their public entity. Similarly, if the duties are fiduciary then does the proper plaintiff rule still apply? This article explores whether directors of public entities owe fiduciary duties to the entity similarly to company directors and whether the proper plaintiff rule might still apply to parties wishing to bring a suit against a director in breach. The article considers the operation of the Public Administration Act 2004 (Vic) in this area and concludes that directors of public entities likely owe fiduciary duties to the entity and that the rule in Foss v Harbottle likely still applies to parties seeking to bring a suit against a director in breach. This article reproduces part (with modifications as necessary) of a Ph D dissertation in law to be submitted by the author for examination in 2014. Despite Schmidt v Rosewood Trust Ltd  3 All ER 76, in Australia there remains conflicting judicial approaches to the task of determining whether a beneficiary has a right or entitlement to access trust documents and information about the trust. As a means to alleviate the uncertainty and in an attempt to regulate what a beneficiary can access, the use of information control mechanisms in trusts deeds are being employed. This article addresses the conflicting foundational theories and, in light of Re A Trust  SC (Bda) 16 Civ;  BMSC 14, considers whether information control mechanisms effectively limit the nature and scope of a beneficiary’s entitlement to trust information. The size of commercial law firms operating in Australia, coupled with increased partner movement between those firms, means that robust and effective practice management has become critical for the identification, avoidance and management of conflicts. This article analyses the use of information barriers (traditionally referred to as “Chinese walls”) as a way of managing this risk and, in particular, considers the circumstances in which information barriers are commonly used by commercial law firms, namely: acting for multiple clients in the same, or related, matter; and acting against former clients; and how the courts have viewed the use of information barriers in these scenarios in the context of a lawyer’s professional responsibilities and duties. Are law schools producing too many lawyers? What place does “moral obloquy” have in the evaluation of statutory unconscionable conduct? What are injuries caused by a motor accident? 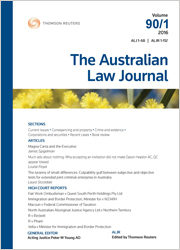 For the pdf version of the table of contents, click here: WAU – ALJ Vol 88 Pt 6 Contents.